It’s a very exciting time to be an entrepreneur in India. Just a few months ago, after Prime Minister Narendra Modi launched the Global Entrepreneurship Summit, a $2 billion national fund to support women entrepreneurs was launched. This is not money to lend to women – this is money to create the support systems women need to access working capital and grow their businesses. This follows on the heels of a relatively recent national drive for financial inclusion; pretty much every household in the country now has at least one bank account. That’s some 300 million accounts. And there are several other national drives underway. There’s a national digital literacy drive to bring rural India into the digital fold – the largest of its kind in the world; a Make in India drive that’s focused on boosting local manufacturing; and an Invest in India drive that’s focused on bringing in foreign direct investment. When I set up Mann Deshi Bank 20 years ago, poor women had no place to save their money. No bank would accept their money; it was just too expensive to service them. We were the first bank for rural women in India. Today we are one of many women’s banks across the country. For me, the best way to judge how ready India really is to support entrepreneurship is to talk to rural women at the grassroots. Are they able to grow their businesses? How do they see the future? A few days ago, I was in conversation with a few women who run tiny businesses. Married off before she could finish high school, Seema Gawli, a diminutive lady who packs a punch when she speaks, talked about how excited she was because she had started manufacturing useful tools for middle class housewives to store everyday household items. With a small business loan from Mann Deshi Bank she had set up her business. Things had gone very well and she had bought a small van so that she can visit different weekly village markets every day, selling her products and researching her customers. She has employed half a dozen women and is bursting with ideas. She also needs a significantly larger loan to scale up her business. All the women I spoke to were keen to take their businesses to the next level. What’s interesting is how keen they are to embrace digital and cashless technologies to improve efficiency and earn some money in the bargain. One enterprising young woman talked about how she had started teaching the women in her self-help group to use the government’s app to directly transfer money. She had, in no time at all, trained hundreds of women in her village. I also spoke to a young woman – who had barely finished her seventh grade – who was now a para-vet. She was an expert in artificial insemination for goats, was using digital technologies to create and track her database, and was successfully challenging all sorts of caste and gender-based hierarchies in her village. 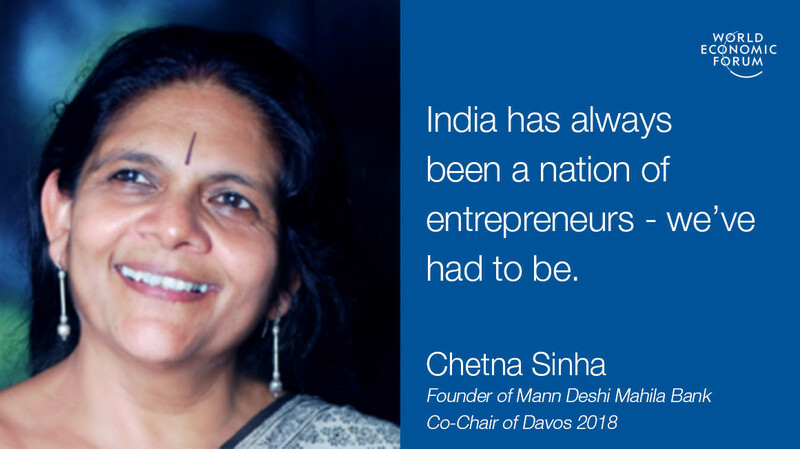 The point is that India has always been a nation of entrepreneurs – we’ve had to be. But most small businesses have, so far, depended on the informal economy for access to credit. This is changing as formal financial and state institutions realise that a significant part of the massive job growth India needs is going to come from nurturing entrepreneurship. There are bank re-finance schemes such as Mudra and Stand Up India that target marginalised communities; and with increasing access to information and technology, the demand from the grassroots for business loans is growing. In fact, I see this every day because poor rural women now want real-time, doorstep and mobile banking from Mann Deshi. This helps them build their digital histories, which in turn demonstrates and boosts their creditworthiness. The National Stock Exchange has a platform, which is barely six years old, dedicated to small and medium-sized enterprises. Only a few weeks ago, the Commerce Minister specifically mentioned the critical role it could play to nurture the country’s economic growth. There is no reason why – in the near future – something similar cannot be set up for micro-enterprises that will open up avenues for impact investment and finance in an unprecedented manner. In fact, globally there is a great deal of interest in social bonds that channel philanthropic money to encourage entry and innovation for social businesses. India’s policy environment is ripe; the ability to implement programmes for millions of people within a short period of time is well established; and there is enormous enthusiasm at the grassroots. Also, within the next 10 years, India’s middle class will balloon to over 500 million people – a massive market. My organisation, Mann Deshi, recently brought 90 women we work with to display their products at an exhibition we had organised for them in Mumbai, which over 30,000 people visited in just four days. I hope that the national fund to support women entrepreneurs will encourage one-stop innovation hubs, especially in villages, small and peri-urban towns, where women can access working capital loans that go well beyond microfinance; have access to information on the latest technologies – whether digital or hardware – that promote business efficiencies; provide customised services for expansion; create debt counseling and refinancing facilities; and help women access bigger, better and newer markets. There is simply an enormous business opportunity just waiting to be tapped. I’m talking about not just moving out of poverty, but moving towards prosperity. If we want to invest in creating a shared future in a fractured world, we must create a supportive environment for women like Seema. I imagine thousands of women like her milling through hundreds of different trade exhibitions across the country designed to showcase the latest small machinery for micro-entrepreneurs; making connections with local logistics companies; being courted by formal financial institutions and impact investors; and spoilt for choice with customised marketing and digital software. She doesn’t need to be ‘educated’ or ‘mentored’. When I asked her how she managed to get around from village market to village market, she laughed and said, “Google!” Whether it’s Mhaswad, New York or Johannesberg, women just need an opportunity to fulfil their aspirations. Like I said, it’s an exciting time to be an entrepreneur. And it’s a very exciting time to be a woman micro-entrepreneur from rural India.